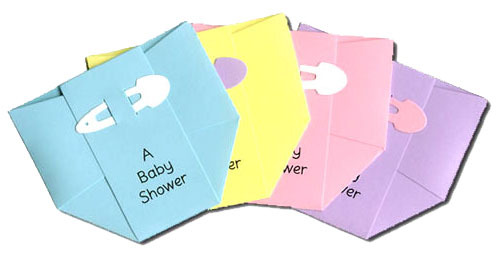 Unique custom baby cards set a theme of “fun” to your shower. A set of 12 diaper thank you cards to be used as thank you notes for either baby gifts or a baby shower. Write a personal thank you note on the inside. 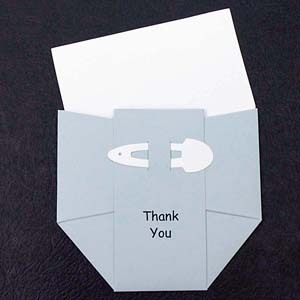 Each diaper thank you card is sealed with a pin. Very cute and fun. 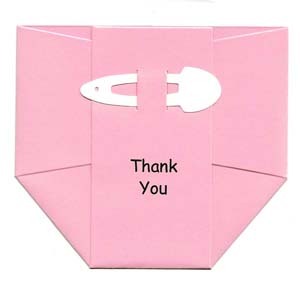 √ Great gift for a baby shower to make sending thank you notes easy and fun! Light pink with a white pin. Packaged in Sets of 12. Light blue with a white pin. Packaged in Sets of 12. We usually ship within 72 hours. NOTE: We can NOT overnight ship. Because it is a customized item and delivery carriers can not be 100% reliable, we have decided to no longer offer overnight shipping on our diaper personalized baby thank you notes. Check out our diaper invitations that can be customized with your own verse, baby’s name and more! Our adorable Onesie Baby Shower Invitations are die cut from Patterned Card Stock. The cards measure approximately 4¼” by 6¼”. Each card is adorned with a coordinating satin ribbon.